Definition: The amount of money frame by the supplier for the supply of electrical energy to various types of consumers in known as an electricity tariff. In other words, the tariff is the methods of charging a consumer for consuming electric power. The tariff covers the total cost of producing and supplying electric energy plus a reasonable cost. Time at which load is required. The power factor of the load. The amount of energy used. The total bill of the consumer has three parts, namely, fixed charge D, semi-fixed charge Ax and running charge By. 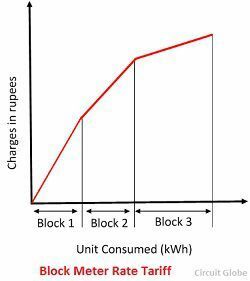 A – cost per kW or kVa of maximum demand. B – cost per kWh of energy consumed. D – fixed charge during each billing period. This is known as three-part electricity tariff, and it is mainly applied to the big consumer. Types of Load – The load is mainly classified into three types, i.e., domestic, commercial, or industrial. The industrial consumers use more energy for a longer time than domestic consumers, and hence the tariff for the industrial consumers is more than the domestic consumers. The tariff of the electric energy varies according to their requirement. Maximum demand – The cost of the electrical energy supplied by a generating station depends on the installed capacity of the plant and kWh generated. Increased in maximum capacity increased the installed capacity of the generating station. The time at which load is required – The time at which the maximum load required is also essential for the electricity tariff. If the maximum demand coincides with the maximum demand of the consumer, then the additional plant is required. And if the maximum demand of the consumers occurs during off-peak hours, the load factor is improved, and no extra plant capacity is needed. Thus, the overall cost per kWh generated is reduced. The power factor of the load – The power factor plays a major role in the plant economics. The low power factor increases the load current which increases the losses in the system. Thus, the regulation becomes poor. For improving the power factor, the power factor correction equipment is installed at the generating station. Thus, the cost of the generation increases. The amount of energy used – The cost of electrical energy is reduced by using large amounts of energy for longer periods. 1. Flat demand rate tariff – The flat demand rate tariff is expressed by the equation C = Ax. In this type of tariff, the bill of the power consumption depends only on the maximum demand of the load. The generation of the bill is independent of the normal energy consumption. This type of tariff is used on the street light, sign lighting, irrigation, etc., where the working hours of the equipment are unknown. The metering system is not used for calculating such type of tariffs. 2. Straight-line meter rate tariff – This type of tariff is given by the equation C = By. The generation of the bills depends on the energy consumption of the load. Thus, different types of bills are generated by the consumers. 3. Block meter rate tariff – In this type of tariff, the energy consumption is distinguished into blocks. The per unit tariff of the individual block is fixed. The price of the block is arranged in the decreasing order. The first block has the highest cost, and it goes on decreasing accordingly. The price and the energy consumption are divided into three blocks. The first few units of energy at a certain rate, the next at a slightly lower rate and the remaining unit at a very lower rate. 4. Two-part tariff – In such type of tariff, the total bill is divided into two parts. The first one is the fixed charge and the second is the running charge. The fixed charge is because of the maximum demand and the second charge depends on the energy consumption by the load. The factor A and B may be constant and vary according to some sliding. 5. Power factor tariff – The tariff, which depends on the power factor of the load is known as the power factor tariff. The power factor tariff is mainly classified into two types. a. kVA maximum demand tariff – This is also a two-part tariff. The low power factor increases the KVA rating of the load. The kVarh is inversely proportional to the power factor of the load. c. Sliding Scale or Average power factor tariff – In Average power factor tariff, the particular value of the power factor is taken as reference. If the power factor at the consumer end is low, then the consumer has to pay the additional charges. Similarly, if the power factor of the load is above from the reference value, then the discount will be given to the consumer. 6. Seasonal rate tariff – Such type of tariff measures the high price in kWh used by the consumer in one complete year. It is also known as the on peak season tariff. If the low consumption occurs in the year, then it called the off-peak season tariffs. 7. Peak-load tariff – Such type of tariff is similar to peak load tariffs. The only difference is that the seasonal tariff measures the peak hour of the year and the peak tariff calculates it for the day. If the power consumption is high, then it is known as the on-peak tariff, and for low power consumption, it is called off-peak load tariffs. The peak load and seasonal tariffs both are used for reducing the idle or standby capacity of the load. 8. Three-part tariff – The three-part tariff is in the form of, and it is applied to the big consumer. Very very effective. We want other contents also like the total electrical chapter on the transformer, dc machine, AC fundamentals, etc. Superb explained but please also mention related to the tariff used in Indian Railway.